The Iraq Stock Exchange (ISX), as measured by the Rabee Securities RSISUSD Index, started the year not with a bang but with a whimper, as befits the ending of the Chinese year of the Dog, by going mostly sideways on a continuation of the low turnover of the last few months. However, the emergence of a moderate foreign seller took the index down to about -5% for the month before buyers emerged to absorb some the selling, taking the market to a decline of -3.1% for the month. 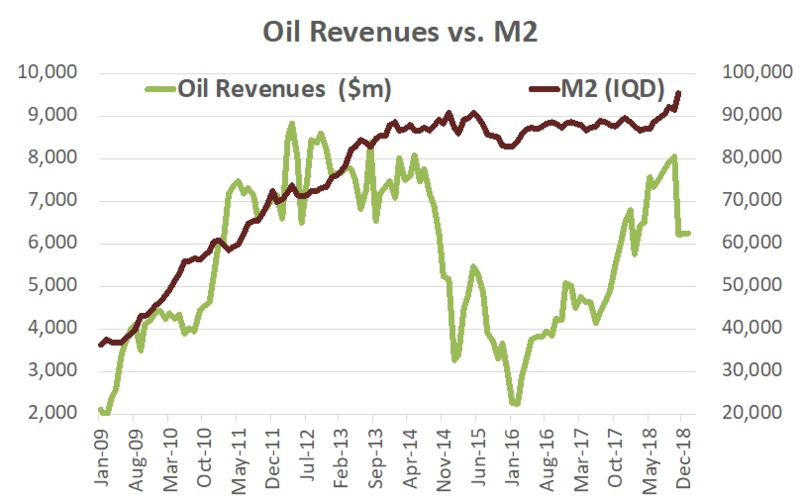 The real economy on the other hand is showing increasing signs that liquidity is returning as the healing effects of higher oil revenues over the last two years are having a positive effect. As reported last month, this was seen in the recent recovery in broad money, or M2 which acts as a proxy for economic activity. Driving the recovery in M2 has been the growth in the monetary base M0-defined as “the sum of currency in circulation and reserve balances in Iraqi Dinars (IQD) held by banks and financial institutions with the Central Bank of Iraq (CBI)”. The clearest evidence of this nascent recovery is seen in the IQD Current Account (C/A) component of banks’ reserves with the CBI, which has been behind the recovery in M0 as seen in the chart below. 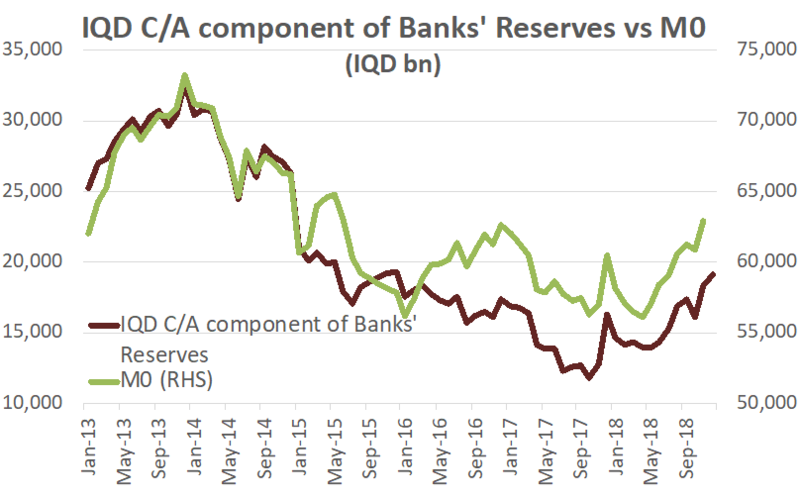 The IQD C/A component of banks’ reserves with the CBI, reversed its multi-year decline in late 2017 and began a recovery that picked-up momentum in May 2018, with the latest data as the end of December 2018 showing a continuation of this trend. This in turn is driven by the level of customer deposits (consumers, businesses and government) held with the banks. The early evidence of increased private sector deposits was discussed a few months ago in “Of Banks and Budget Surpluses”, however the granular data for private sector deposits is only available for end of 2017. The rise in deposits for 2018 is likely to have been driven by government deposits, which should lead to a rise in private sector (consumers and businesses) deposits as the government begins its spending programme as discussed later in this report. The current trends indicate a continuation of this recovery, and as such to a continued recovery in M2. The latest M2 figures from the CBI for October and estimates for Novemebr (based on MO figures for November and recent M2/M0 multiplier figures) support this as can be seen from the chart below. The prospects of increased economic activity got a boost with the end of the government’s spending paralysis, as parliament finally approved the 2019 budget in mid-January. The budget, however, is heavily skewed towards current spending, as opposed to investment spending, as both of parliament and government are under pressure to appease the population with some immediate rewards from the end of conflict and the recovery of oil prices. (for a review of the budget see the appendix in this report). The government’s financial firepower is considerable, as the latest Ministry of Finance (MoF) budget report of October 2018 shows a surplus of USD 21.5bn for the first 10 months of 2018. As such, in addition to the surplus of USD 1.5bn for 2017, this means that the government could easily achieve the estimates made here over the last few months—a two-year surplus of USD 24.5bn by end of 2018. The immediate consequence of government spending would be improvements in consumer and business sentiment leading to a pick-up in consumer and business spending, and subsequently an economic recovery as the multiplier effect works through the economy. The long term sustainably of the upcoming economic recovery would be driven by the implementation of the government’s non-oil investment programme for 2019 of about USD 12.5bn, which would be equivalent to about a 7.5% stimulus to the estimated non-oil GDP for 2019. The recovery in M0 that is leading to a gradual recovery in M2 seems to be happening in a mirror image of Ernest Hemingway’s phrase on going broke, i.e. “Gradually and then suddenly” (attributed in error here in the last few months to Mark Twain), and so the next few months should see this translate into actual economic recovery. If we are to go on similar experiences in other frontier markets (of declining markets while fundamentals show gradual recovery following a long basing period) then the market’s declining trend of the last few months should be followed by a sharp reversal and the beginning of a new trend. Mr Tabaqchali (@AMTabaqchali) is the CIO of the AFC Iraq Fund, and is an experienced capital markets professional with over 25 years’ experience in US and MENA markets. He is a non-resident Fellow at the Institute of Regional and International Studies (IRIS) at the American University of Iraq-Sulaimani (AUIS), and an Adjunct Assistant Professor at AUIS. He is a board member of the Credit Bank of Iraq.